Ultimate Bass Play-Along Led Zeppelin Volume 2 PDF + Mp3 CD download. All new transcriptions and tracks drawn from more than 30 years of documentation, interviews, and recorded footage. These TABs and tracks deliver unprecedented accuracy and insight into the music of Led Zeppelin. This book includes complete music notation and TAB transcriptions to eight Led Zeppelin classics. There are two versions of every song on the included CDs: an instrumental sound-alike recording, and an instrumental accompaniment track (without bass) so you can play along. When you use the CDs in your Mac or Windows-based computer, the TNT (Tone ‘N’ Tempo) Changer lets you easily loop sections for practice, slow tracks down or speed them up without changing the pitch, change the key, and switch back and forth between full instrumental and accompaniment tracks. 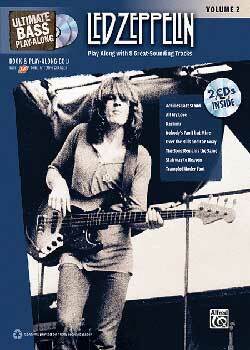 Download Ultimate Bass Play-Along – Led Zeppelin Volume 2 PDF free and other books from our site. Only high quality PDF scans. Please write a review, it's important for our community.